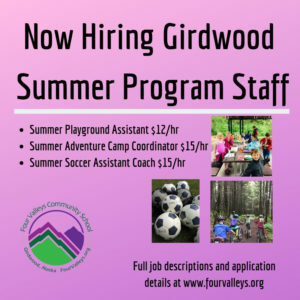 We have 2-3 positions open for our 2019 Summer Program team; Summer Playground Assistant and Adventure Camp Coordinator. 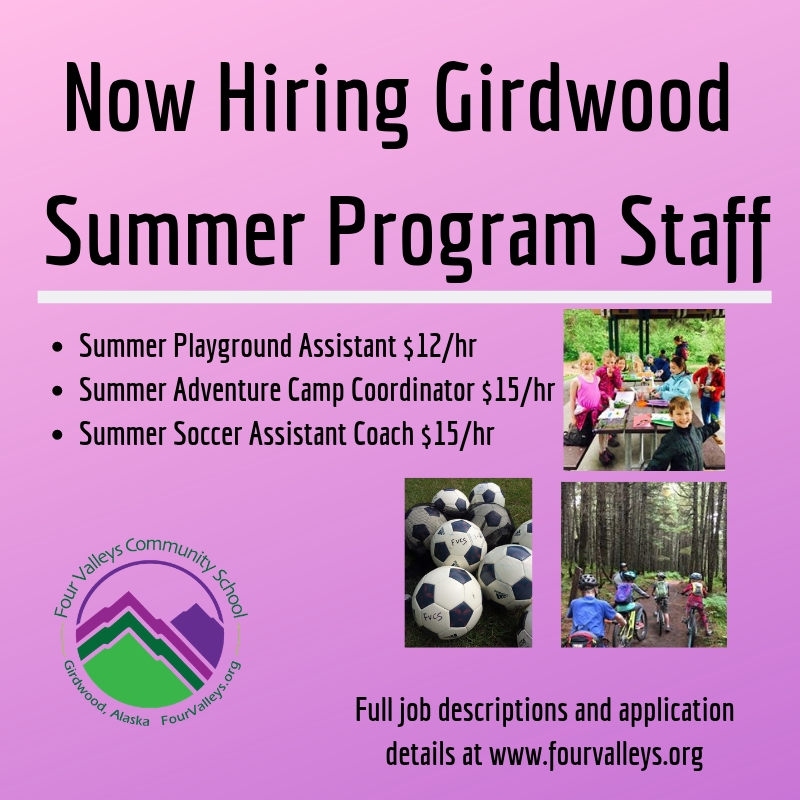 We are also hiring for a Assistant Soccer Coach and this position (for the right person) can be combined with the Adventure Camp Coordinator listed previously. Applications are being accepted NOW and application period is open until positions are filled. To apply, please apply for position(s) by filling out the FVCS Application, and returning it along with a Letter of Introduction and Resume. 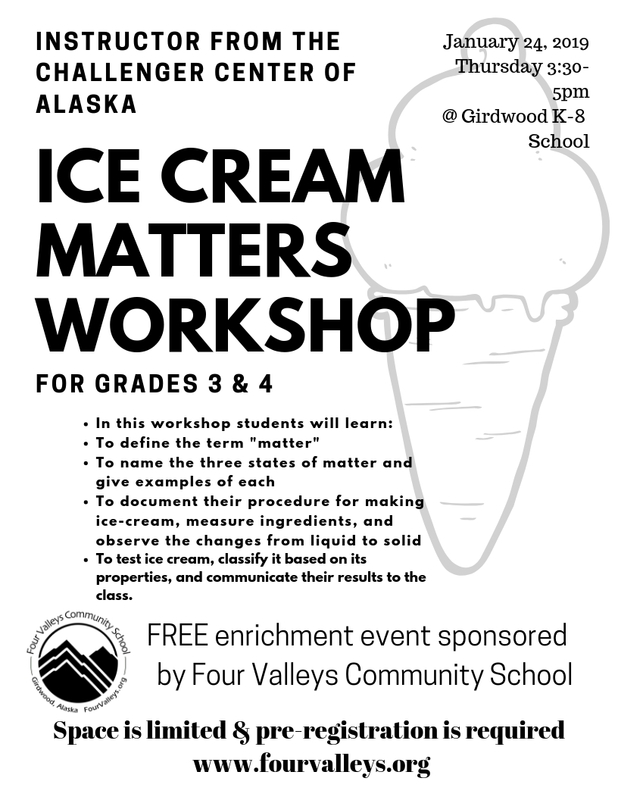 Return applications to cmcdermott@fourvalleys.org, or by mail to PO Box 790, Girdwood, AK 99587. Four Valleys Community School is an equal opportunity employer. Our Summer 2019 Programs for kids are now open for registration! Core programs include Outdoor Soccer, Summer Playground and Adventure Camps (12 to choose from!). Register early to guarantee space. We have scholarships, financial aid, and payment plans available. The application period is now OPEN for this scholarship aimed at graduating high-school seniors and awarded each spring. 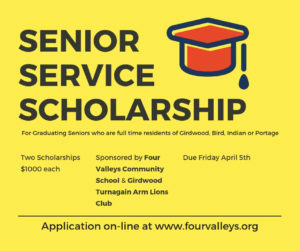 Four Valleys Community School partners with Girdwood Turnagain Arm Lion’s Club to provid e two $1000.00 scholarships for graduating seniors. Applicants interview with a small committee. 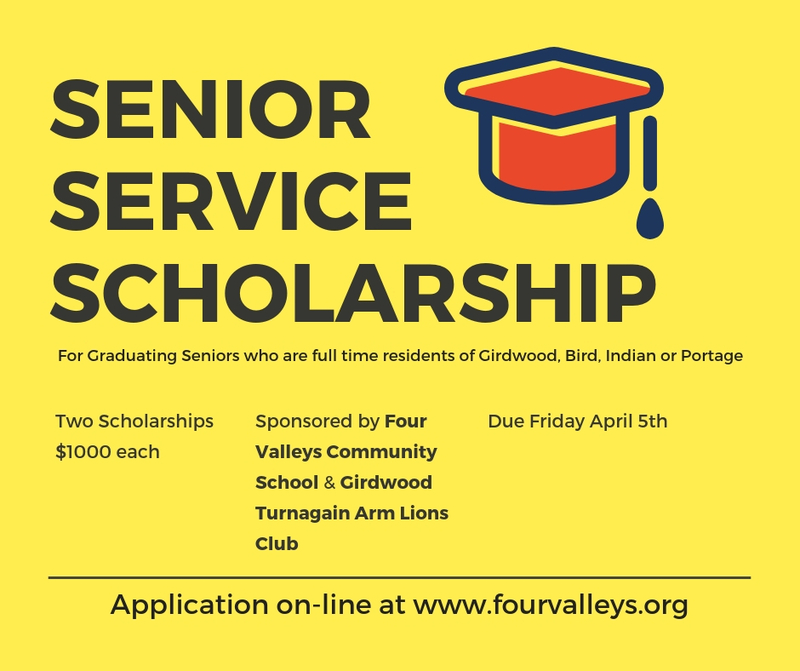 Applications are due to the Four Valleys Community School office no later than Friday April 5th. 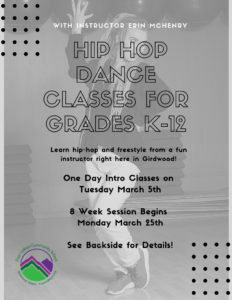 In this series of dance classes our instructor, Erin McHenry (see bio bottom of this page), will teach the fundamentals of hip-hop, jazz (& street jazz) with a little bit of acrobatics thrown in too. Each class will be tailored for the specific age group, including age-appropriate music. 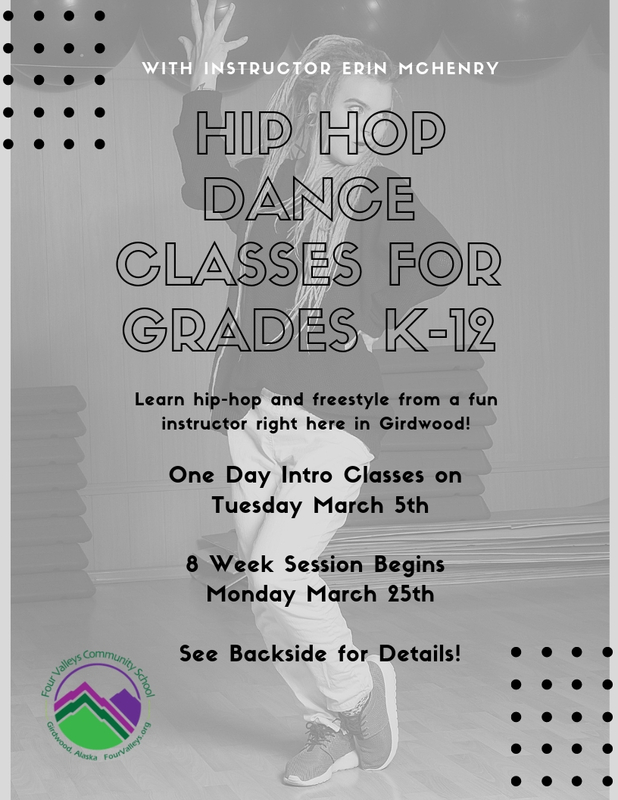 We’re so excited to offer these fun dance classes right here in Girdwood! 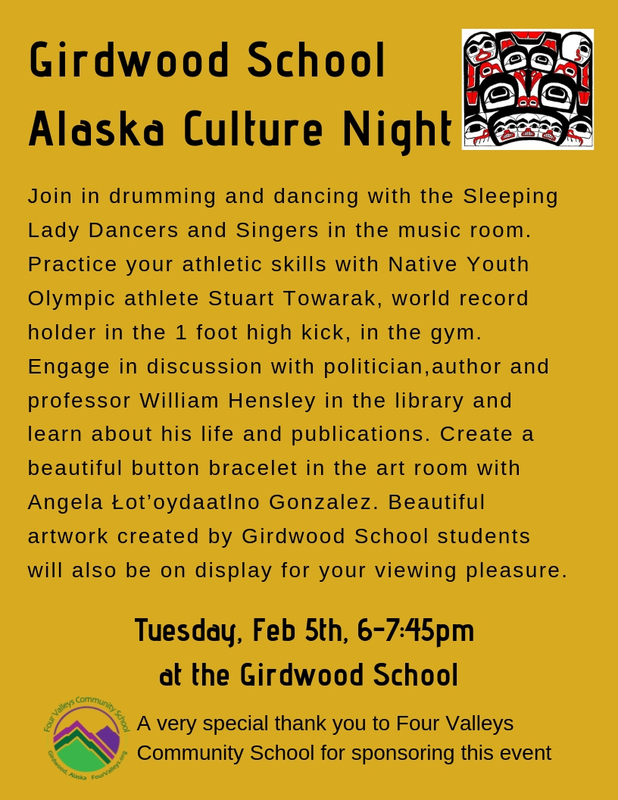 Scholarships and financial aid for these classes are available thanks to a grant from the Atwood Foundation to bring dance to Girdwood kids! Give our office a call at 742-5317 or print-out the Program Scholarship Application and return to the FVCS office. Try them out for $10! Erin McHenry is currently a student at University of Alaska Anchorage. She has been a dancer since she was four, dancing with Barbara’s School of Dance for 14 years where she is no longer a student and has since become an instructor. She also danced with Drift Gallery Dance Studio. Her areas of dance interest include tap, acrobatics, ballet, jazz, contemporary, lyrical and many different forms of hip-hop (breaking, popping, locking, etc). She is a very involved teacher, and excited to come to Girdwood to meet new kids who are ready to learn to dance! 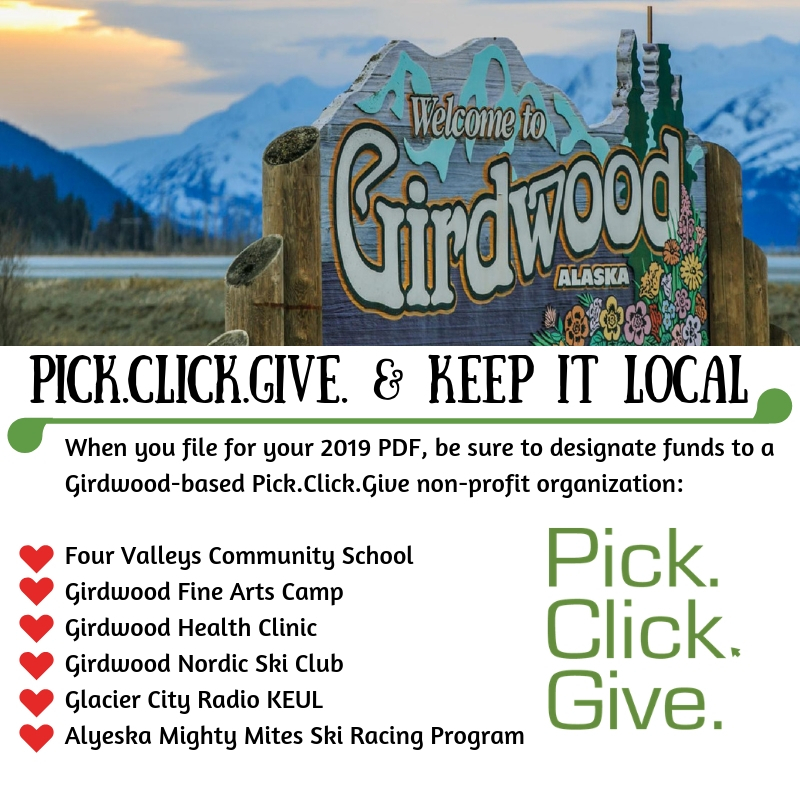 There are SIX Girdwood based non-profits who are part of the 2019 Pick.Click.Give program, including Four Valleys Community School. We are proud to part of a collaboration of non-profit organizations who serve our community. When you file for your 2019 PFD and designate Pick.Click.Give funds please remember your local non-profits who serve our community. 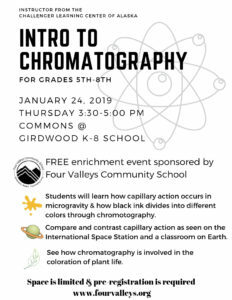 FREE After School Science Enrichment Events Thursday January 24th Sponsored by FVCS & Our Donors! 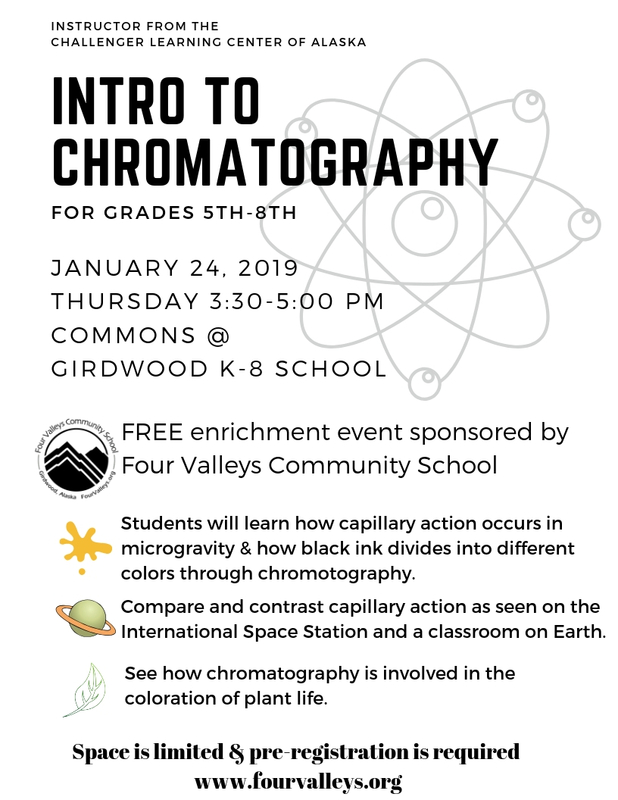 These free enrichment events are sponsored by Four Valleys Community School because we love hands-on learning and watching our youth grow into life-long learners. 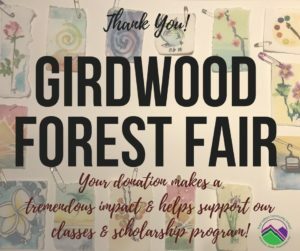 We couldn’t do it without donations from Pick.Click.Give, support from Girdwood Board of Supervisors, funds from donors like the Girdwood Forest Fair Committee and individual donors (listed below). Thank you for supporting community education in Girdwood! 2018 Donors: Rorie Hammel, Mike Edgington & Kalie Harrison, Lin Hinderman, Jerry & Carol Fox, Chloe Wurr, Sarah Haynes-Cronk, Linda & James Stinson, Jeff & Sharon Samuels, Jonnie & William Lazarus, The Libby Group, Pat & Betsy Preis, Justin Persons, Rainbo, Josh Meister, Brian & Barbra Shore, John Weddelton, Robyn Kenny, Sally Randich, Ambler Stephenson, Shane Patrick, Alex Fletcher/Spoonline, Tyson & Cedar Ruckle, Girdwood Chapel, Oona & Odin Whitman, Carl Propes, Susan Carse, Brian & Misty Pekar, Mark & Julie Jonas, Carolyn Seramur, & Pieter Vander Hoek. To register follow these links! There is snow on the valley floor here in Girdwood, and the New Nordic Trail is groomed and ready for skiers! 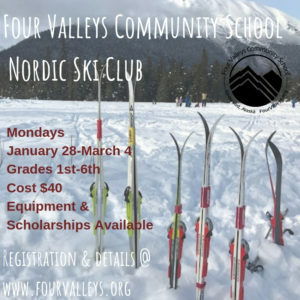 The FVCS Nordic Ski Club program starts January 28th. For now we have snow. Depending on conditions, our program will be a combination of dry-land training and (hopefully) Nordic skiing for kids Grades 1-6th. Get your skiing legs under you while you are young! We will get the kids out playing fun games, drills and exploration on cross country skis right here in our beautiful valley. Register HERE.Once you register, you are eligible to borrow gear over the Winter Break. Gear check-out will be Wednesday December 19th from 3:15p-4:30p in the Girdwood K-8 School gym. Can you volunteer to ski with a group and coach? Please let Head Coach Karen Loso know via text or e-mail (contact below). Bring your own skis, boots and poles (see equipment note below). We have a very limited amount of loaner equipment, contact the FVCS office 742-5317 if you are in need of gear. Equipment note: All skiers will need classic, fish scale skis, Nordic bindings and boots. Poles optional for Grades 1-2. Location may vary each week. Meet at Moose Meadows first class. We are going to have fun with this and get the kids outside and active, if not on skis than in shoes! Snack note: Parents need to sign-up for a snack or hot drink for one of our practice meets. Please contact Kari Hendrich (link below) to sign-up for your date. 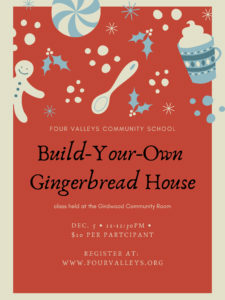 Join FVCS staff this “earthquake” break and come build and design a gingerbread house. FVCS will provide each participant with their own kit. 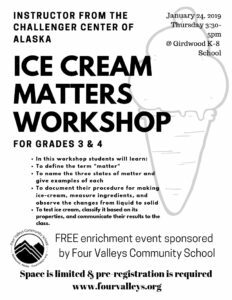 Participants in grade 1 and below need a parent chaperone during this class.